A powerful and intense 2 1/2 day simulation based on actual events, The CML Experience® provides a practice field involving major crises and workplace violence situations. Designed to provide the theories of crisis management to emotionally engage adults in learning from their failures and teaches that effective, engaged leadership can almost always predict, and prevent most crises in the workplace. The program effectively allows employers to prepare and manage this risk in today’s new legislative environments that provide for criminal prosecution of companies and employees. The CML Experience® is intended for human resources staff, operations staff, distribution center staff, risk management, corporate communications leaders, and executives in the US and Canada. Learn to recognize the symptoms that lead to crises and what leaders MUST know about dealing with media in a crisis. Gain the tools to anticipate, prepare for, respond to and recover from crises. Learn the math of reputation management and the science of attacks on corporate reputations. Develop skills to recognize escalations and warning signs of workplace violence. Learn to intervene proactively or reactively to prevent workplace violence. 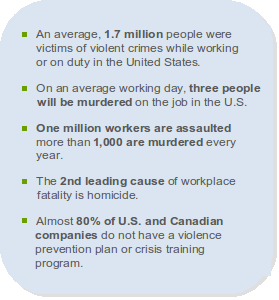 Learn about model workplace violence prevention plans. Experience an unfriendly courtroom in an experiential module on corporate and individual negligence. To speak with one of our dedicated staff to learn more about how we can facilitate our CML Experience® simulation at your location, contact us today.